First, let’s break down the basic features, functions and capabilities of EAM, CMMS and where the two collide. On a very basic level, some of the differences between these two categories of software are evident in their names. Computerized maintenance management software includes the word “maintenance,” and that’s its major focus. CMMS helps streamline and automate maintenance tasks, providing communications for maintenance-related activities. A simple EAM system definition can be found in its name: enterprise asset management software includes the term “asset management.” Its focus is generally on preserving assets for their full lifecycle and maximizing their potential for enterprise use. It is generally considered to be a subset of CMMS that offers a greater specificity of asset targeting features. It can do what a CMMS does and then some. Here’s an example: historically, EAM systems would offer an asset lifecycle management module. All assets have a set lifespan, and in order to effectively manage assets, it is key to be aware of where that asset is in its lifecycle. This helps determine if that asset is providing value to your business. Asset lifecycle management functionality helps users plan for updates, replacements and other changes that might cause serious setbacks if they happen by surprise. Another way to explain the general difference between CMMS and EAM is with a simple logic statement — that while all (or most) EAM solutions have some CMMS capability, not all CMMS tools have EAM functionality. Another way to say this is that EAM is broader and more comprehensive than CMMS, more sophisticated in general and more robust in terms of its application. The differences are sort of like those between BI and BA, in that one is included inside the scope of the other. Or, think about the difference between EAM and CMMS in terms of size and company structure. In some cases, companies may upgrade to EAM when they have outgrown a simpler CMMS program. Some experts suggest establishing a rule of thumb when considering purchasing or upgrading: one is that a company with over 100 maintenance personnel should consider EAM tools. Another could be an organization that operates more than one or two facilities should consider an EAM. A company with more diverse maintenance staff — for example, a company with mechanical maintenance teams as well as IT maintenance departments — might make more use of EAM solutions. A smaller company that may only have a dozen or so maintenance workers could be fairly happy with the limited functionality of a CMMS suite. When it comes down to it, only you can decide which system is right for your business. Start by checking out our CMMS features and EAM requirements guides to understand the feature-specific differences between the two. You can also download our interactive CMMS/EAM requirements template to find out which would be best for you. 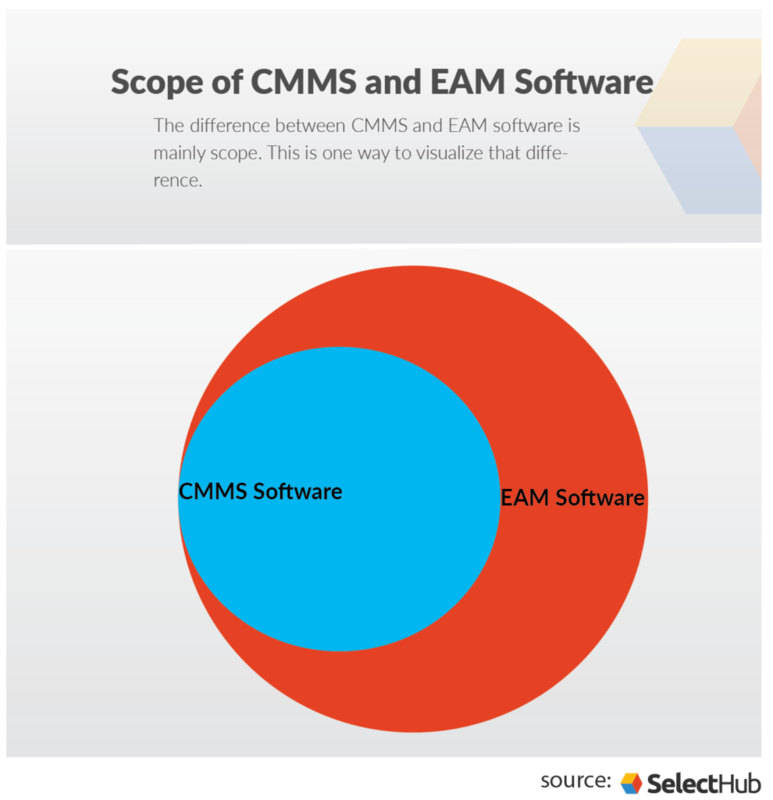 Another key area where EAM vs CMMS differ is who is using them. For CMMS, it is typically technicians, maintenance workers and operations teams using them directly to manage their operations. EAM software is used by these same groups as well, but is additionally utilized by C-level users, accounting and compliance teams addressing overarching asset issues, budgeting, and more.  One of the most common ways companies use CMMS is as a communications process for work orders and other maintenance tasks. Before CMMS existed, employees would use punch cards to communicate what work needed to be done, had been done and would be done in the future. With the dawn of computers, that unwieldy system has been digitized, improved and expanded. Thinking about CMMS as a work order system is helpful to this debate because it’s part of how many companies have benefited from implementing these tools. As new software products have helped the business world modernize, systems that were originally designed for one thing — say, keeping track of maintenance performed on assets — evolve to become the go-to for a range of new tasks that were once the purveyance of something else entirely. CMMS is a good example of this. As it has developed, the lines between CMMS and EAM have begun to blur. In order to stay competitive, CMMS vendors are adding more EAM-type features to CMMS systems on the market, so the confusion is understandable. The idea behind CMMS is you need a centralized space to keep track of all existing work orders and maintenance requirements. When you don’t have one of these centralized spaces, things go missing and items get overlooked. Emails are accidentally deleted, memos are misplaced, that job everyone thought Jerry was going to do was actually Kevin’s, etc. The primary use of CMMS in many companies is as a digital system for making sure that maintenance tasks get done by the correct person. It also ensures that maintenance requests are logged and that each machine or asset gets its own designated maintenance monitoring. As a concentrated system, a CMMS suite may be great for specific things like predictive and preventative maintenance. It may have just the right range of features for documenting everything that goes into regular and consistent maintenance, but not a lot of peripherals involving asset credentialing or vendor relationships. So CMMS can be great for a team that is only focused on keeping machines running, but not as good for a team that is tasked with making long-term use decisions. The use of EAM, again, is much broader and geared toward a greater spectrum of monitoring and planning outcomes. It includes the maintenance perspective, but it isn’t called EAM maintenance software, because that is a secondary aspect of its abilities. EAM includes elements of design perspectives centered on the idea that by creating digital models, companies can optimize how they utilize each asset that they invest money in according to its build and the greater context around its use. This helps companies better predict asset depreciation and never be surprised by unexpected asset failure. EAM tools also include insurance and warranty information. They look at things like the environmental performance of an asset or piece of machinery to assist with audit trails and environmental impact reports. They also integrate with inventory and supply chain software to reduce menial data entry tasks and perform inventory management tasks. Another way to describe the key use of EAM solutions is they ensure change never affects the total cost of ownership (TCO) of an asset. Some EAM systems may often be expanded to include more future functionality. Some of these systems can use application programming interfaces, or APIs, to connect to a broader IT architecture. EAM allows for executive-level viewing and feedback in order to help decision-makers chart the best course for business. This can be seen in reporting and analytics features that deliver business intelligence data directly from your EAM. In a sense, EAM tools provide basic maintenance scheduling abilities, plus more of a context for planning and evaluation. In the same ways customer relationship management software facilitates connections with a customer base, EAM tools give leaders a birds-eye view of what’s going with every one of their assets. Even after all this conversation about question of CMMS vs EAM, the answer is still: it depends. 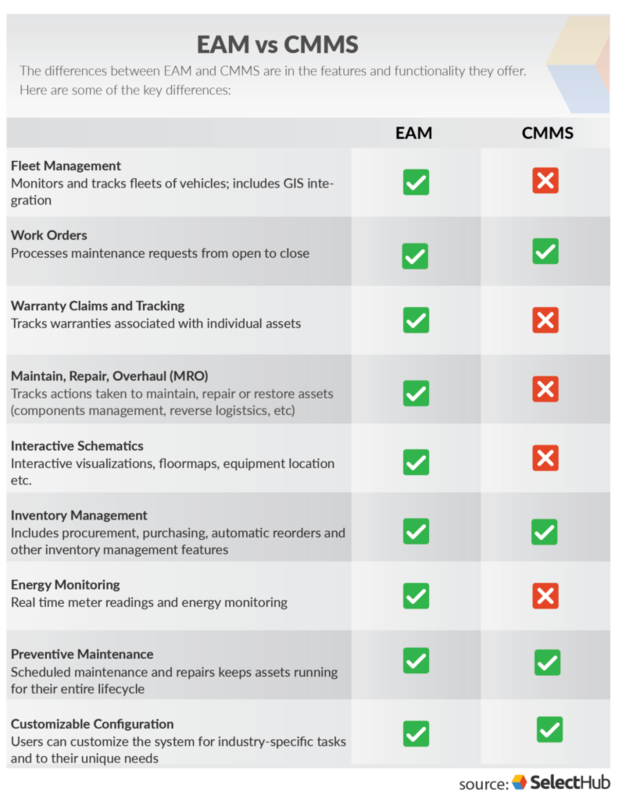 The differences between computerized maintenance management software and enterprise asset management software vary from system to system, and they are also blurring as both become more advanced. The increase in data collection, usage and analysis will make these types of software even more comprehensive and powerful. A future of interconnected machines and the IoT means significant changes for CMMS and EAM, all of which are exciting. Those with a responsibility to build software architectures for businesses can look at EAM and CMMS systems side-by-side to get an idea of what types of features and functionality each toolset has, with the understanding that EAM will generally aggregate more diverse tools than CMMS. How do you think EAM/CMMS are changing? Has implementing one of these systems changed how your organization operates? Let us know your thoughts in the comments! Thanks for your comment! Yep, as I mentioned at the beginning of the article, that’s very true. This is a generalization of the industry as a whole for people who aren’t sure what the main differences are, but you can definitely get much more nuanced with it on a case-by-case basis.